The SVTR is planning a work party and pot luck cookout for this coming Saturday 6/3. We have sent out scouting parties over the last few weeks to check on conditions and clean up some of the trees that came down over the winter and with the last storm. Overall, things are in pretty good shape but we still need to clean out culverts, fix up many of the water bars, clean up any remaining dead fall as well as cut back brush that may be hanging into the trails. If we get a good turnout for this work party, we expect we can get everything done and be able to open the trails for the season. We plan to meet at the Joy Brook trailhead at 9am, sign up members, assemble teams and assignments then head out on the trails by 10. We will fire up the grill at the landing and be ready for lunch at 1pm. After lunch, we will head back out to finish up whatever remains to be done. 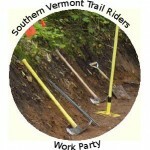 If you plan to sign up at this work party, please try to arrive by 9am as we will be out working on the trails after 10. See our memberships page for the SVTR membership form and information on joining. The club will provide hot dogs, burgers and buns. Please bring your own drinks and a dish to share. The opening weekend cook out is always a great time and the food is always excellent! Come join us! This entry was posted in Work Detail and tagged Picnic, Trails, Work Party. Bookmark the permalink.